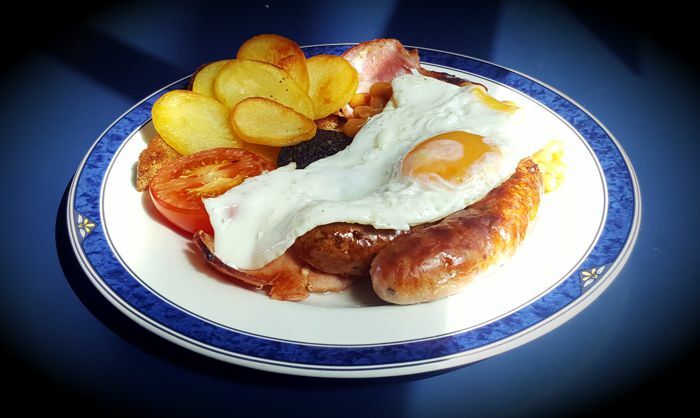 What better way to start the day than with a hearty Great Central Railway breakfast. Our Griddle Car service provides passengers with a steam-age experience, serving hot and cold food and drink from our original 1960s kitchen car. It's a walk-on service, so there's no need to book. Just look out for the fork and circle symbol of "Griddle Car" on the timetable. Vegetarian options are also available. Order and pay for your meals at the Griddle Car bar and we'll serve the food to your table. 2 bacon, 1 sausage, black pudding, 2 eggs, fried bread, grilled tomato, beans, sauté potato. Cheese or mushroom omelette. Served with sauté potatoes, grilled tomato, and beans. 2 Quorn sausages, 2 eggs, fried bread, grilled tomato, beans, and sauté potatoes. 1 sausage, 1 egg, sauté potatoes and beans. Slice of today's quiche, lettuce, tomato, cucumber, onion, ham, cheese, pickle. Ham, cheese, jam, egg mayo, tuna sweetcorn, cucumber, tomato, pickle, onion, mustard, chutney, beetroot. All items are offered subject to availability and are subject to change without prior notice.